Situated in Monteroni d'Arbia, this hotel is 3 mi (4.9 km) from Val di Merse and within 6 mi (10 km) of Museo della Mezzadria and Museum of Sacred Art in Val d’Arbia. University of Siena and Siena Cathedral are also within 12 mi (20 km). Situated in Monteroni d'Arbia, this farm stay is within 6 mi (10 km) of Porta Romana, University of Siena, and Siena Cathedral. Piazza del Campo and Basilica di Santa Maria dei Servi are also within 6 mi (10 km). How Much is a Hotel Room in Monteroni d'Arbia? Hotels in Monteroni d'Arbia start at $60 per night. Prices and availability subject to change. Additional terms may apply. 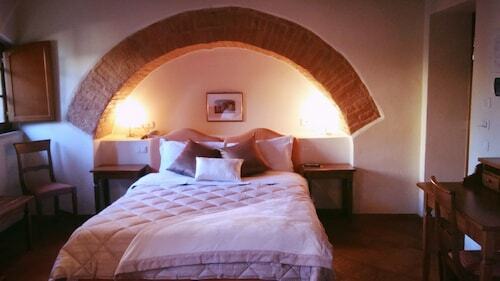 If you would like to book lodging options in the Monteroni d'Arbia area, it's helpful to know there is a treasure trove of different options available. We currently offer a total of 41 accommodation options within a 6-mile (10-kilometer) radius of Monteroni d'Arbia's downtown precinct. You can book Hotel More di Cuna and Il Pozzo di Radi within strolling distance of downtown Monteroni d'Arbia. 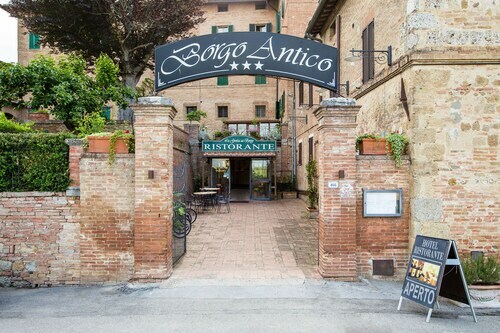 The Hotel Borgo Antico is an economical accommodation option. You'll find it nicely situated 2 miles (4 kilometers) from the center of Monteroni d'Arbia. Also, you could check out the rates and amenities at the Hotel 1000 Miglia. The Castello Banfi - Il Borgo is located 16 miles (27 kilometers) away from the center of Monteroni d'Arbia. Another option is the Relais Borgo Santo Pietro, which is positioned 14 miles (23 kilometers) away. Some other Travelocity-listed accommodation options include the Rosewood Castiglion del Bosco and the Castel Monastero. Following your exploration in Monteroni d'Arbia, ensure you allow time to check out some other attractions in Tuscany. Spend time at Tuscany's ruins and castles and photograph the area's rural landscapes. Common things to do in this area of Italy include snowboarding and skiing. Val d'Elsa is 19 miles (31 kilometers) northwest of Monteroni d'Arbia and is home to Archeological and Collegiate Church Museum and Torre Rognosa. The Tenuta Di Mensanello and Torraccia di Chiusi are a few of the great long and short-stay alternatives in Val d'Elsa. Or, stay the night in Val d'Orcia, 18 miles (29 kilometers) southeast of Monteroni d'Arbia, where you can pick from the Adler Thermae Spa & Wellness Resort and Hotel Osteria Dell Orcia. If you stay in Val d'Orcia, make sure you explore the Collegiate Church of San Quirico and Palazzo Chigi. Get yourself a fix of local sport by taking a voyage to Stadio Artemio Franchi, which is 40 miles (63 kilometers) to the north of Monteroni d'Arbia. Find a Travelocity-listed room not far from the action at the Four Seasons Hotel Firenze or the The St. Regis Florence. If you're flying through Peretola Airport and choose to book a room in the area, why not consider Torre di Bellosguardo or Sina Villa Medici.